According to statistics of consumer associations nationwide, all together 702,484 cases of consumer complaints were settled in 2013, of which, 635,748 cases were closed, accounting for 90.5% of the total cases and redeeming RMB 1.17157 billion of economic losses for consumers. 9,459 cases were double compensated for fraudulent conducts of business operators, and the double compensations amounted to RMB 17.09 million. In 2013, consumer associations of all levels received 1.9 million visiting and consulting consumers. 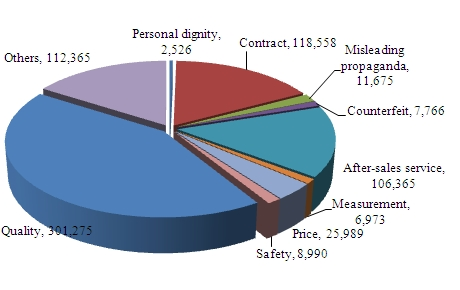 According to the classification of complaints (as shown in Chart 1), among the complaints submitted in 2013, 42.9% were about quality, 16.8% about contract, 15.1% about after-sales service, 3.7% about price, 1.7% about misleading propaganda, 1.3% about safety, 1.1% about counterfeit, 1.0% about measurement, 0.4% about personal dignity, and 16% were others. 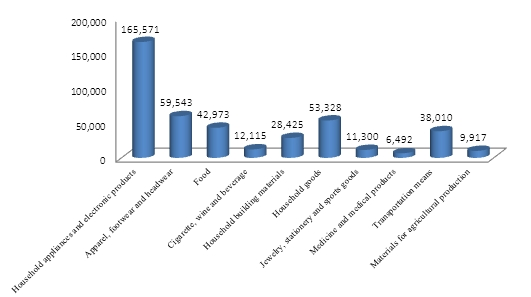 Compared with 2012 (as shown in Chart 2 and Table 2), the complaints about household appliances and electronic products, apparel, footwear and headwear, household goods, food and transportation means rank top on the list of complaints about commodities in 2013. The proportion of complaints about household appliances and electronic products, household goods, transportation means, jewelry and stationary and sports goods witnessed a slight increase. In 2013, the number of complaints about telecommunication products, food, apparel, automobile and parts (as shown in Table 4) topped the list of complaints about commodities. Of which, the number of complaints about automobile and parts rose by 66.5% year on year, from 15,173 cases in 2012 to 25,268 cases in 2013. The number of complaints about telecommunication products increased by 24,415 cases, or 57.1% compared with that of 2012. Among the complaints about services, the top ten categories of complaints in number are mobile phone service, Internet access service, shopping by media, store sales, maintenance and repair service, etc. (See Table 4) What deserves our attention is that the complaints about express delivery service surged by 77.6% year on year, from 4,598 cases in 2012 to 8,166 cases in 2013, and the complaints about maintenance and repair service rose by 4,408 cases in 2013, or 61.3% more compared with that of 2012. Statistics showcase that the number of complaint about sales service totaled 49,914 cases, of which 20,361 cases were complaints about shopping by media, ranking third among complaints about services and accounting for 40.8% of complaints about sales services. 12,950 cases were complaints about online shopping, making up 63.6% of the complaints about shopping by media. The booming development of online sales has enabled consumers to have more choices. However, with the rapid development of online shopping, lack of integrity has increasingly become a major factor for constraining its healthy development. First, fake and shoddy goods also exist in online shopping and online shoppers being tricked are reported frequently. Second, some online retailers provide poor quality service and overdue and non-performing delivery. Third, online stores fail to meet their after-sales commitments. When a dispute over online shopping occurs, the consumer may want to return the commodity. However, some online stores ignore or refuse consumers’ return requests and even delay the time and pass the buck. In July 2013, Ms. Mao from Shanghai bought a pair of leather sandals manufactured by a Chengdu company on a shopping website. But, she found the leather was not the same with the advertising after receiving the sandals. Besides, the sandals had a strong smell. On the next day after receiving the sandals, she went to a professional shoe store for examination, and the result showed that it’s synthetic leather. The shopping site promised “compensation in advance” and “compensate ten for one fake”, so Ms. Mao claimed three times the payment for the shoes and the express fee that are RMB 516 in total as the compensation from the website. The two parties involved in the case reached an accommodation under the mediation of local consumers’ association. With the improvement of people’s living standard, family car is no longer a luxury product but a tool for riding instead of walk and family car consumption has been ever growing. However, as the vehicle population keeps increasing, complaints about cars and parts have also risen apparently. In 2013, consumer associations nationwide settled a total of 25,268 complaints, up by 66.5% compared with 15,173 cases in 2012. This remarkable increase has something to do with the enhancement of state’s protection of car consumers and the improvement of consumers’ awareness to safeguard their rights. After the formal implementation of the Provisions on Repairing, Replacing and Returning Liabilities of Family Cars on October 1, 2013, complaints about car products have markedly increased. Analysis shows that the three major issues regarding family cars complained are quality, contract and after-sales service. The number of complaints about quality recorded 10,385 cases, accounting for 41.1% of the total complaints about cars; the number of complaints about contract was 5,422 cases, accounting for 21.5%; the number of complaints about after-sales service was 4,493 cases, accounting for 17.8%. Quality was mostly complained by consumers. Chongqing consumer Mr. Liu bought a car on November 25, 2013, but the car begun to sound abnormally after driving 700 mileages on the sixth day. He had the car repaired in 4S store for many times but failed to find the cause. The car was bought after the release of the Provisions on Repairing, Replacing and Returning Liabilities of Family Cars (“three guarantees”), according to which consumers could ask the retailer to change another car of the same brand and same model with the proof of “three guarantees”, the maintenance and repair records and the purchase invoice within the warranty period if the repair time surpassed a total of 35 days due to quality problems or surpassed 5 times due to the same quality problem as provided by the provisions of the “three guarantees”. Besides, Mr. Liu could also claim compensations for the economic losses caused by repairing the car. Finally, the two parties involved in the case reached an accommodation under the mediation of Chongqing consumer association. The Provisions on Repairing, Replacing and Returning Liabilities of Family Cars has been implemented for only a short period of time, so the peak time for complaining automobile products has not yet come. According to the provisions of the “three guarantees”, the possibility of a further increase of complaints is not ruled out. Automobile product operator shall abide by the stipulations of the “three guarantees”, pay attention to improving the quality of their products, do a good job in serving consumers and actively assume the responsibility of protecting consumers' rights and interests. In 2013, the number of complaints about household appliances and electronic products stood at 165,571 cases, accounting for 23.6% of the total complaints, up by 0.4% compared with that of 2012. The complaints were mainly about quality, after-sales service and contract. The number of complaints about quality was 82,502 cases, accounting for 49.8% of the complaints about household appliances; the number of complaints about after-sales service recorded 46,505 cases, making up 28.1% of the total complaints about household appliances. The main problems were about household appliances like air conditioner, freezer, color TV set and washing machine. Manufacturers usually promise a three-year period of “three guarantees” when consumers buy their products, but business operators refuse to provide free repair for consumers once problems occur. Besides, the repair time is arbitrary and business operators usually delay the repair with different unreasonable excuses. In addition, the after-sales price of spare and accessory parts are not transparent that has infringed upon the consumers’ right to know. Ms. Zhang, a consumer from Nantong City of Jiangsu Province, bought an air conditioner in January and had it install in March. The air conditioner was still noisy after the shell was repaired twice. Ms. Zhang requested a replacement, but the seller turned down the request and only agreed to repair it on the grounds that the two previous repairs were not recorded timely. Ms. Zhang made a complaint and the seller replaced the air conditioner with a new one upon meditations. With the rapid development of long-distance shopping, express delivery business has grown over time and the accompanying complaints are also on the increase. 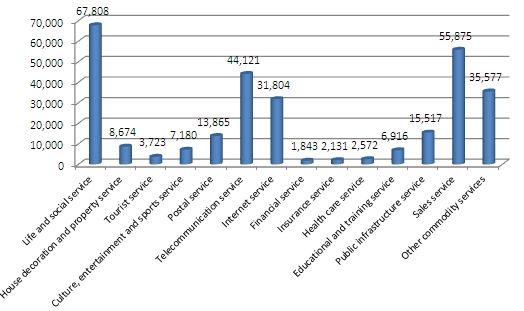 In 2013, the complaints about postal service were 13,352 cases, of which 8,166 cases were about express delivery, accounting for 61.2% of the total complaints about postal services. The complaints were mainly about: 1. overtime delivery caused by express companies’ delay of delivery on the one hand and long express delivery time on the other hand; 2. damage of goods, express business uses fewer times to deliver more goods, the professional quality of some couriers are low and the quantity of goods for delivery is large during holidays and festivals, so the parcels of consumers are damaged in transit; 3. unreasonable compensation, consumers’ complaints are mainly concentrated in unreasonable compensations for damage of their goods that are more expensive and uninsured; 4. another focus of complaints is about signing for the express first before examining the goods, especially when the goods are more valuable and fragile, which have caused inconvenience to consumers’ assertion of rights. Mr. Zhou is a consumer from Hunan Province. At the end of July 2013, he received some cans of milk powder delivered by an express company, but he found that the outer packing was broken and the milk powder leaked out. Mr. Zhou paid RMB 42 for buying the RMB 1,400 insured value for the milk power. So Mr. Zhou refused to sign for the delivery and claimed a compensation for it. Mr. Zhou complained to the express company, but the company turned down his reasonable compensation claim on the grounds that “the insured valued was for a lost case but not for a damaged case”. After many times of communication, the company finally agreed to compensate RMB 700 and dispose of the leaked milk powder on its own. Mr. Zhou considered that the milk powder may go bad if the case was not settled for a long time and the cans have been out of shape, so he reluctantly agreed the compensation offer. In 2013, food-related complaints nationwide totaled 42,973 cases, of which 4,521 cases were about health care products, accounting for 10.5% of the total complaints about foods. These complaints were mainly reflected by the sellers’ conscious choice of some middle-aged and aged people with chronic disease and desires of good health; release of information about health care products on newspapers, periodicals, TVs, radios and other mainstream media highly trusted by consumers. Besides, the sellers of health care products violated regulations by exaggerating and false publicity, so consumers found that the products do not have the effects as publicized and some consumers even delayed normal treatment as they wrongly believed the propaganda. Since the sales of health care products involves complex personnel, uncertain whereabouts, multiple links, and most retailers are targeting at cross-regional sales and have no fixed site for business operation, which have resulted in difficult handling of complaints about health care products. Mr. Chen bought a variety of health care products from a company in May 2013 as the company advertised that the product could cure cardiac-cerebral vascular disease, high blood pressure, diabetes and many other diseases. So, Mr. Chen spent RMB 50,000 to buy the products. After taking RMB 30,000 of health care products, he found there was no effect as advertised, so he claimed the return of the products. Upon mediation, the company returned some money to Mr. Chen. As the living conditions of residents keep improving in recent years, home decoration as an important part of housing consumption has become a focus of consumers gradually. At the same time, complaints about consumption in the decorating industry keep increasing mainly in two aspects, namely the house and building materials for one part and house decoration service for another. On the one hand, the complaints of consumers about housing and building materials totaled 28,425 cases in 2013, of which, 16,192 cases were about decoration materials, accounting for 57% of the total complaints about housing and building materials. 8,945 cases of complaints were about the quality of decoration materials, making up 55.2% of the total complaints about building materials; 2,675 cases were complaints about contract, comprising 16.5% of the total complaints about building materials; 1,749 cases were complaints about after-sales service, representing 10.8% of the total complaints about building materials. On the other hand, 7,804 cases of complaints were about house decoration and property service, of which, 4,104 cases were about house decoration service, making up 52.6% of the total complaints about house decoration and property service. 1,610 cases of complaints were about quality and 1,346 cases of complaints were about contract, accounting for 39.2% and 32.8% respectively. Statistics indicate that the three leading complaints about interior decoration materials involved non-standard decoration contract, disqualified decoration materials and unguaranteed after-sales maintenance support. Ms. Li is a consumer from Dalian City of Liaoning Province. She bought the floor of a brand on January 28, 2008 with a warranty period of 5 years. Due to quality problem, she requested after-sales repair in January 2013. The seller agreed to repair but had always been evasive. Ms. Li was dissatisfied and requested a meditation. Upon meditation, the seller offered free on-site repair. The complaints about traffic service totaled 6,387 cases in 2013, rose by 49.4% year on year. Typical complaints were about peak traffic period when some train and air ticket agents got out of line in raising price due to the shortage of tickets, making tickets that are already high in price even more insufficient. Taking air ticket as an example, as the economy class air tickets of some hot air routes are sold out in an instant during peak times, so some passengers have to pay higher price for tickets. Ticket scalpers (including operators) should be firmly cracked down on and the price increased should be returned to consumers to protect their interests. It is learned that some professional tourism websites can check and compare the price announced by ticket agents and the full price of airlines through technological means. All prices surpassed that of the standard air tickets would be shielded by these websites through technological means and are not allowed to be sold to consumers. Operators of air tickets should not shirk responsibilities on the grounds of work faults. Tourist complaints totaled 3,561 cases in 2013, an increase of 30% compared with that of the previous year. In high season, the price of rooms booked by consumers was also raised by operators arbitrarily sometimes and consumers would have nowhere to live if not accepted the increased price. (h) More complaints about the quality of mobile phone. Among all complaints about telecommunication products, the focus was mainly on mobile phones. 47,849 cases of such complaints were submitted throughout the year, accounting for 71.2% of the total complaints about telecommunication products and 28.9% of the total complaints about household appliances. Of which, 23,062 cases were about the quality of mobile phones, comprising 48.2%; 15,395 cases were about after-sales service, about 32.2%. The typical manifestations are that: 1. when there is a problem to a mobile phone, the repairer would say there was no spare parts for not repairing the phone, which would affect the consumer’s normal use of the phone; 2. within the warranty period of “three guarantees”, quality issues occur frequently to mobile phones that could not be normally used even after several times of repair, or even after being changed because the operators failed to fulfill their corresponding obligations of “three guarantees”; 3. the actual functions of newly bought mobile phones by consumers are inconsistent with the sellers’ advertisement. Consumer Li bought a new mobile phone from a telecommunication device seller at the price of RMB 2,950. After using it, Li found that the phone had a short stand-by time and often crashed. On the second day, Li contacted the seller and requested changing a new one but was turned down. Having no choice, Li submitted a complaint to the consumers’ association of Ninghe County, Tianjin where the operator is located. After receiving the complaint, the working staff of the association went to the seller together with Li to verify the case. The working staff of the association pointed out to the seller according to the Rules on Responsibilities for Repair, Replacement, and Return of Substandard Commodities of Mobile Phones, “If the product has performance failure within 7 days after being bought, the consumer could ask for return, replacement or repair of it. The seller should return all the payment at one time when the consumer asked for return.” In the end, the seller changed a new phone for the consumer.